As the holiday season ramps up this year, I wanted to take a few moments and reflect on what I am thankful for, and to challenge us all to not only be grateful for what we have, but also to consider what we can share with those around us. Thanksgiving brings with it a wave of gratefulness – some post 30 days of thankfulness on social media, we share a meal in the very spirit of being thankful for all we have, and we spend time with those for whom we are most thankful: our family and friends. I am thankful for the opportunity of this organization to provide programs and services of choice for our students, school districts, and families. Those who buy or receive services from us do not have to do so, and I am grateful that we have become a leader in our region, an organization to which others look for guidance and success. I am thankful for our staff. Whether you are a teacher, administrator, clerk, maintenance worker, support staff, an accountant, or any of the countless other positions within our organization, you are an important piece of our BOCES. I value you the personality and perspective you bring to our organization. Without a dedicated, unique staff, we would not be able to fulfill our purpose of bringing top-quality programs and services to our region. I am thankful for our many community partners. Without their support, many of the opportunities we offer students and educators in our region would cease to exist. Whether a business has supported a teacher in the Summer STEM Research Institute, hosted Career & Technical Education student interns, or served as a work-based learning site for our programs for students with special needs, these partnerships are vital to our success as an organization, and they embody the true meaning of collaboration, which at its core, is the essence of BOCES. Thank you for your commitment to helping our students succeed in whatever comes next in their lives. 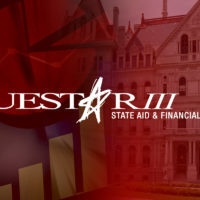 Questar III is the sum of our many relationships with staff, students, parents, school districts, community partners and countless others. We provide students with life-changing experiences and school districts with the service, leadership and expertise that makes them more efficient, effective and responsive. As we reflect on the many things we are thankful for this holiday season, I also encourage you to share what you can with whoever you are able to share it with. This could be a meal, a smile, a story, a helping hand, or a sense of compassionate humanity and care for others.